Before the Gypsy's , for 25 yrs, we bred , trained and showed some of the best Arabian, AQHA , Paint , and 1/2 Arabians we could , Sought out the best bloodlines , breeding stallions and mares we could to produce the quality we felt was the best. Always keeping in mind, quality not quantity, as we are in our new venture with the gypsy horses. So some of these horses listed below are left from our breeding program, and we have had them since birth although hard to part with them, they need to move on to homes where they are being used. Some are horses that we are asked to sell or place in homes that are perfect for them. We have a strict guideline required to sell a horse , and pride ourselves, in an honest representation of the horses and finding the right owner for each horse, so everyone is happy including the horse. Thank you for looking.. 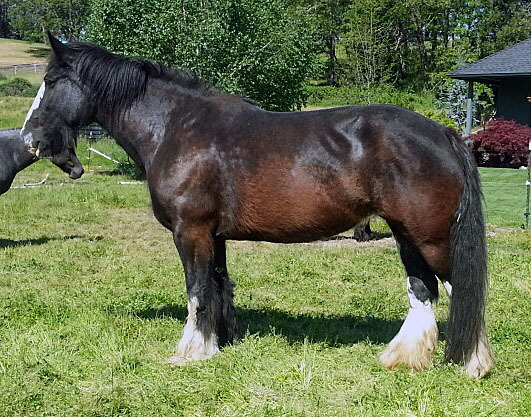 Registered SHIRE mare . Extremely well bred old lineage! very hard to find old country breeding. She is 18 hds and outstanding mover ! Will be excellent Drum producing mare will produce some of the top drums in the country ! 9 yrs old very sweet. TONS of hair. $8,500 sells with breeding to one of our gypsy stallions.